The miniature compression and tension load cells of the LCM201 Series are designed for the demanding environment of industrial automation and robotics. With a main body diameter of only 19 mm and all stainless steel construction, it can fit into small systems and survive harsh environments. The LCM201 delivers high accuracy and long term reliability in a subminiature package. 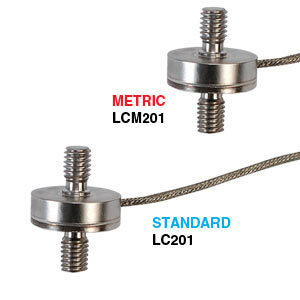 Nota: All LCM201 load cells are calibrated in tension and include a 5-Point calibration certificate at 0%, 50%, 100%, 50%, 0% of full scale.